Many of you have asked to see the inside of my shop. So I thought I'd take you on a field trip. 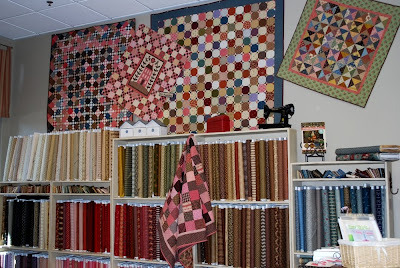 This is our collection of civil war fabrics. We have a huge variety! Can you tell that I love this era? Here is our check-out desk. 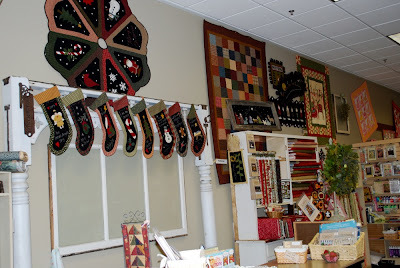 We have a lot of Everyday, Christmas, and other seasonal wool projects. Yes, wool is another favorite of mine. This corner is dedicated to our current seasonal fabrics. 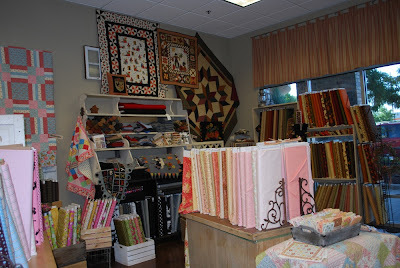 We carry patterns and kits for the quilts that we hang throughout the store. Let me know if you see a quilt you like, We can totally hook you up. I also design patterns. The name of my patterns are "Under the Garden Moon". 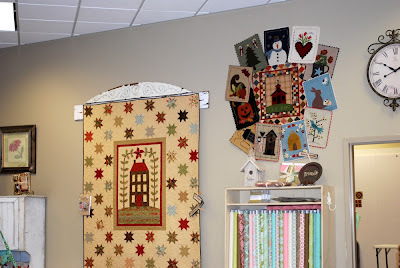 The Seasonal wall hangings on the right side by the clock are called "As Time Goes By". There are 12 separate mini wool quilts you can change monthly. They are attached to a cotton background quilt. If you want to view all of my patterns you can also click on the link on the side bar. This is our 30's kids corner. We carry juvenile prints and a lot of reproduction fabrics, too. Here is a peek at our reproduction area. I also love "American Jane" and it fits right into this corner of the shop. 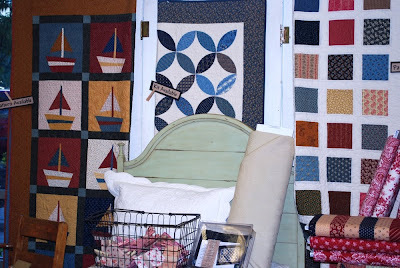 The cute sailboat quilt is a "Buggy Barn" pattern. 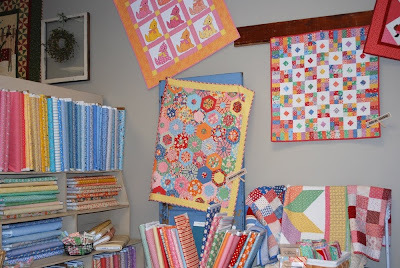 Since I took these pictures, the shop has now taken on a new look because we are always adding new quilts, great kits, and wonderful new fabrics and patterns. 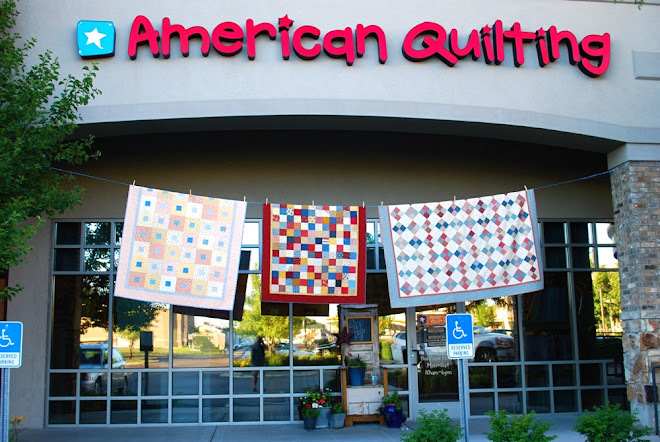 If you ever travel to Orem, Utah please stop in and say HI! Thanks for coming along on my little field trip. I love your store Amy! (If I only lived closer). Your store is my fave! I love the 30's/kids corner--as well as the rest of the store....and the people....and the wool...and your excellent patterns! That's it!!!! I'm coming over right now!! Love your store. Great field trip... however...all that eye candy can be dangerous for some of us fabric lovers. 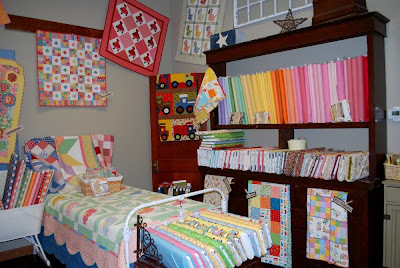 Lovely quilt store...the kids 30's corner is so cute decorated, good for a big kid like me too!